Starfish live underwater but that is where their similarity to a fish ends. As mentioned above, the starfish is not really a fish. They do not have gills, fins or scales and they are actually related to sea urchins, sand dollars and sea cucumbers all of which are echinoderms. 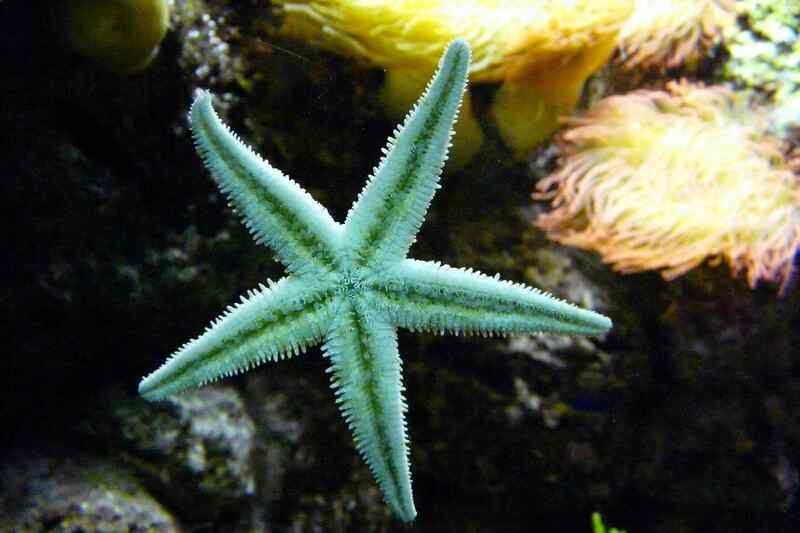 Sea stars actually belong to the class ‘asteroidea’. It is one of the interesting facts about Starfish. Also, read about deadliest fishes in the world. It might sound ridiculous that they survive without blood or brain, but sea stars have an uncommon and simple way to survive. Seawater is pumped throughout their body as a replacement for blood, and this consists of the peculiar ‘water vascular system’. The use of water saves space as there is no need for an intricate blood system in the body and this also serves very well because it can never run out of sea water. So, starfish blood is actually filtered sea water! Another peculiar character of the sea star is the regeneration of their arms and sometimes their entire body! This attribute works to its advantage in various situations. The starfish may lose its arms when they come in contact with a predator or if they are stranded in any other threatening situation. Arms can take days, months, or even years to fully regenerate. But it can regenerate itself into a new starfish with its central disk and with only one arm attached. Sounds pretty cool, right? Yes! Without blood, brain and even a Central Nervous System, it might look a bit out of the ordinary that they have eyes. Just to further add to their peculiar anatomy, their eyes are located on the end of their arms. Whilst their eyes may not be as good as our eyes, they are able to detect different shades of light- which means it can sense light and dark- which is just enough for them to survive in their environment and allows them to pray for food and pull out of the way of predators. You will also like reading about beautiful fishes in the world. Starfish is equipped with hundreds of tiny little feet at the underside and end of each of their arms. To move from one place to another, sea water is filled into its tube feet, causing the arm to move just like a foot would. This mechanism allows the starfish to move – much quicker than you might expect it to! – and the tube feet also help in catching and holding its prey. One of the shocking facts about Starfish. Due to their incredibly tiny mouth present on the underside of their body, it would be impossible for the sea stars to consume only through its mouth. But they have adopted a shrewd way to eat things larger than its own mouth. Interestingly, starfish have 2 stomachs, one to begin the digestion in its body and the other to expand itself and engulf the prey. With the help of this unique digestive system, it can digest complex organisms. To break it down in simpler terms, they have a stomach that can digest food even outside their body. This allows the food to be further broken down into simpler parts of their body. Also, read about beautiful jellyfish in the world. Almost all starfish are shaped similar to a star, which is how they get their group name- ‘starfish’. However, there are always exceptions. The Cushion Starfish has a round ball-like shape but resembles all the genetic characteristics needed to be a starfish. But that is not all. Some species have several more arms. For example, the Sun starfish can have up to 40 arms! Sea stars have a different body chemistry which makes them unsuitable for fresh waters and so, they prefer salt water. All the time. In order to survive, they prefer to stay in salt water environments and tend to inhibit coral reefs, wet sandy patches among other salty areas. If you by any chance, put a starfish in fresh water, it would eventually die. Ranging from 5 to 11 inches, sea stars can be pretty heavy for their size. Their usual weight is 5-6 lbs. but there are about 2000 species of them and there are those which weigh 11 lbs. and even more. Starfish are layered with its outer skin made from calcium carbonate. This strong material makes the skin tough and difficult for hunters to break down and hence giving them extra protection. Some species of starfish will even take a step further with several additional spines on their skin, acting as a layer of armour to avert predators. The average life expectancy of a sea star is 35 years! These are the 10 facts of Starfish. Additionally known as Sea Star they are one of the most beautiful creatures on planet Earth. Starfish reproduce sexually by releasing sperms and eggs known as gametes into the water, Later sperm fertilizes and the gametes and produces swimming larvae that settle on the ocean floor growing into an adult sea star, however, they can also grow asexually through regeneration but that happens when species loses an arm. The sea species can be seen all over the world, however, largest population is in Indian and Pacific oceans.